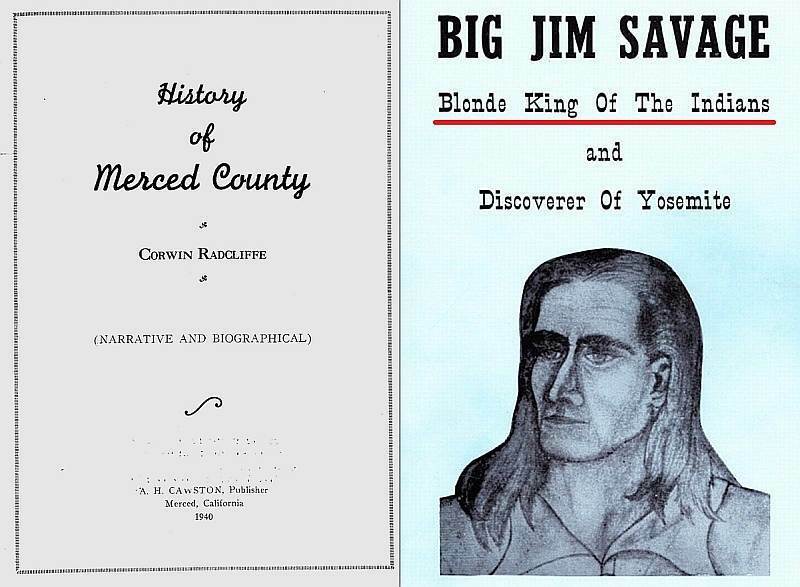 Recently I found this old book called “History of Merced County” by Central Valley historian Corwin Radcliffe. The book was published by A.H. Cawston in Merced, California in 1940. On page 58 is a biography of the first recorded discoverer of Yosemite Valley, James Savage. James Savage was given the title of Major. Savage was the man who led the Mariposa Battalion into Yosemite Valley to clear out and force Chief Tenaya and the Ahwahneechees to move to a military guarded reservation in the Central Valley. He was the bane of existence to Tenaya and the original Indian people of Ahwahnee. Savage’s men had captured Tenaya and in the second expedition led by Boling the Mariposa Battalion murdered Tenaya’s youngest son by shooting him in the back. But James Savage had another title besides Major and the first discoverer of Yosemite Valley. He was also called “The White Chief of the Foothills”. Something that most historians never mention and would surprise most Yosemite history buffs. James Savage was the white chief of many tribes on the western side of the central Sierra Nevada foothills around Mariposa. Those tribes later became the Southern Sierra Miwuks. The Miwoks called James Savage their “Blonde King” or their “White Father”. Savage was their ‘king’ and the different tribal chiefs like Bautista, Cypriano, and Ponwatchee were the sub-chiefs, and leaders of the group of James Savage’s Indians. L. H. Bunnell, in his “Discovery of Yosemite,” says that Savage had located his trading post at the mouth of the South Fork of the Merced, not more, than 15 miles below Yosemite Valley, and on the line of the present Merced-Yosemite highway. “At this point,” quoting Bunnell, “Savage, engaged in gold mining, and had employed a party of native Indians.” Early in 1850 his trading post and mining camp were attacked by a band of Yosemite Indians. This tribe, or band, claimed the territory in that vicinity, and attempted to drive Savage off. Their real object, however, was plunder. They were considered treacherous and dangerous, and were very troublesome to the miners generally. Savage prospered on Mariposa Creek. To keep friendly with the Indians, and to cement the alliance of several tribes, he had taken wives from among the young squaws of different tribes. His Indian wives are reported to have totaled five. Disturbing rumors came to Savage that the mountain Indians were combining to wipe the whites from the hills. These rumors proved not without foundation. In addition to his store on Mariposa Creek Savage had a trading post on Fresno Creek, to the south. News came of an attack on the Fresno store. All of the whites except the messenger who had brought the news, were killed. The Mariposa Indian war was on. Savage went to Horseshoe Bend in the Merced River canyon, to solicit aid. In his absence his Mariposa store was burned, its three white attendants killed, and his wives were carried off by the assailants. James Burney, county sheriff, headed volunteers who had banded for mutual protection. Governor McDougal called for volunteers, and the famous Mariposa Battalion came into existence. Three companies, under John J. Kuykendall, John Boling, and William Dill, were organized and drilled near Savage’s ruined Mariposa store. Savage was made Major in full command. The activities of the Mariposa Battalion were directed against the mountain tribe of “Grizzlies,” and Author Carl Russell says that on March 25, 1851, Savage and his men entered the mysterious stronghold, Yosemite Valley. Much happened in that historic year of 1851 besides the actual entering of Yosemite Valley by Savage and his men. Chief Tenaya and part of his Yosemite tribe surrenedered to the advancing whites. Captain John Boling, one of the commanders of the Mariposa Battalion, made a second entry to Yosemite and captured the Yosemite Indians at Tenaya Lake, when the name of “Tenaya Lake, “ was applied. The captured Indians were escorted to the Fresno Reservation, but in the winter of 1851 Chief Tenaya and his family were permitted to return to the mountains. Chapter III, "One Hundred Years in Yosemite" (1947) by Carl P. Russell recalls the death of Mariposa Battalion’s Major James Savage – The White Chief of the Indians of Mariposa County. Savage was killed by another white man named Walter H. Harvey, on the 16th day of August, 1852 after Harvey killed some of James Savage’s Indians trying to take their land. “You have doubtless ere this heard of the death, or rather murder, of Major Savage upon King’s River. It has produced considerable sensation throughout the country and is deeply regretted, for the country and the government have lost the services of a man whom it will not be easy to replace. He could do more to keep the Indians in subjection than all the forces that Uncle Sam could send here. The Indians were terribly excited at his death. Some of them reached the scene of the tragedy soon after it occurred. They threw themselves upon his body, uttering the most terrific cries, bathing their hands and faces in his blood, and even stooping and drinking it, as it gushed from his wounds. It was with difficulty his remains could be interred. The Chiefs clung to his body, and swore they would die with their father. “The night he was buried the Indians built large fires, around which they danced, singing the while the mournful death chaunt, until the hills around rang with the sound. I have never seen such profound manifestations of grief. The young men, as they whirled wildly and distractedly around in the dance, shouted the name of their ‘father’ that was gone; while the squaws sat rocking their bodies to and fro, chaunting their mournful dirges, until the very blood within one curdled with horror at the scene. “I have not the slightest doubt that there will be a general outbreak this winter. Just as soon as the rainy season sets in we shall have the beginning of one of the most protracted and expensive wars the people of California have ever been engaged in. The Indians are quiet now, but are evidently contemplating some hostile movement. They told me, a few days since, that their ‘father’ was gone and they would not live with the whites any longer. The Ahwahneechees were re-absorbed into the Mono Lake Paiute tribe after the death of Tenaya at the hands of Monos for horse theft. Those claiming to be from Tenaya’s band in Mariposa are actually descendent of James Savage’s Indian workers. Some might even be direct descendents of James Savage himself, the man who destroyed the home of the Yosemite Indian people. "Chief Tenaya was the founder of the Paiute colony of Ahwahnee"
Hello. Please excuse my ignorance, I am a newbie to this subject. Which is an amazing history. The Indians which Savage interacted with in the mining and trading venture, they were Miwoks? When he was killed on the lower Kings River who were the Natives who supposedly mourned his death? The Yokuts , ( wichikits, Chenumnie) or Miwoks who followed him there? I don't find any record of Savage in that area prior to this event on the Kings. There were Yocuts and Miwok, mostly. Chukchansi, Chowchilla, Nochu-chi, and some other bands and tribes. The tribes on the Kings, I am not knowing but the Kaweah Natives were in that area and had been brought in to the reservation. Larry Cooperman https://www.smashwords.com/books/view/308737 "Yosemite, A Gold Rush Memoir." "Yosemite, A Gold Rush Memoir" is seen through the eyes of a Boston Transcendentalist and is a completely new perspective for a "western." Some may see the memoir this way but I know that a western can be a backdrop for a look into an American philosophy that we can surely use now. This memoir does attempt to flush out the character of James D. Savage, the Mariposa Battalion and the Yosemite Indians, particularly Tenaya, their last chief.